Nowadays, we spend more time using a wide variety of digital devices to work, learn and be entertained. Recent digital screens are often equipped with powerful light source such as LED. These digital screens emit intense blue light and can cause eye strain after long exposure. Hoya BlueControl provides a solution to such stressful conditions. LCD and LED computer and television screens, smartphones, tablets and GPS devices all emit blue light. Although blue light in itself is a natural phenomenon - it is present in daylight and help us to stay awake - over exposure can cause eye strain, eye fatigue and even sleeplessness. Hoya BlueControl help neutralises the blue light emitted by LCD and LED screens preventing eye fatigue and eye strain and even sleeplessness. It keeps the eyes in better condition, offering more comfortable and relaxed vision and a better contrast perception when using everyday digital devices. This image shows harmful blue light being filtered by the blue control lens coating which also improves clarity and vision and enhances the scratch, water and dirt resistance of your lens. Even if you are retired, you will benefit from Hoya BlueControl lenses. If you come into contact with TVs, flat screen computers, tablets, laptops, GPS or smartphones on a regular basis, BlueControl lenses will be an option for you. 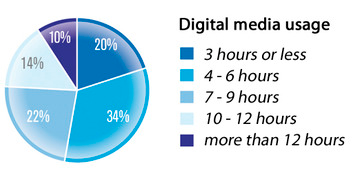 Research* has shown that more than a third of adults spend 4 to 6 hours a day with digital devices, while 14% even spends between 10 and 12 hours a day. Buying the Hoya BlueControl Lens coating and protecting your eyes from harmful LED & LCD devices is as simple as adding it to your lens options when choosing your lenses.